The parish was in the Leadenham sub-district of the Sleaford Registration District. You can also perform a more selective search for churches in the Welbourn area or see them printed on a map. 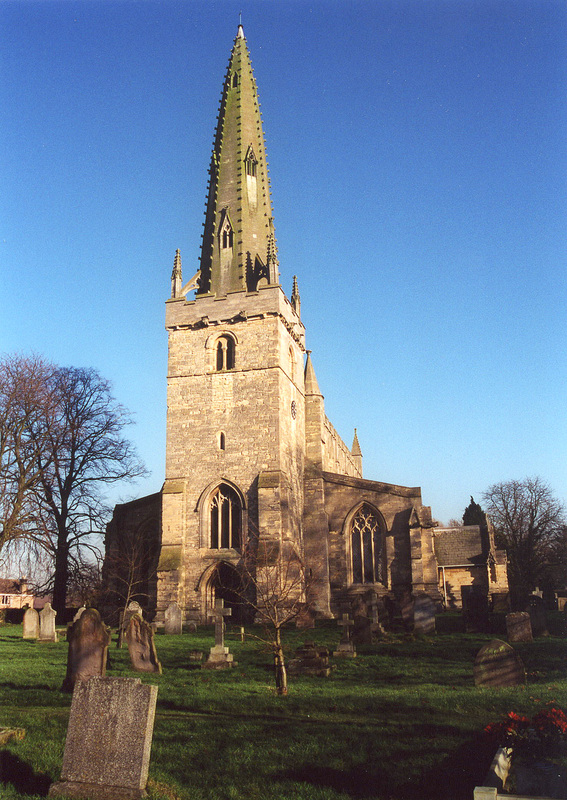 The Anglican parish church is dedicated to Saint Chad and has some parts thought to be of Norman origin. The church was restored in 1884. A photograph of Saint Chad Church is at the Wendy PARKINSONEnglish Church Photographs site. The parish register dates from 1561, with gaps. Boyd's Marriage Index holds parish marriages from 1562 to 1837. The LFHS has published several marriage indexes for the Loveden Deanery to make your search easier. The Lincolnshire FHS has a Loan Library service which has the parish registers on microfiche for Baptisms and Marriages from 1561 to 1812. The Wesleyan Methodists had a chapel here, built in 1839. For information and assistance in researching these chapels, see our non-conformist religions page. Welbourn is both a village and a parish 12 miles south of Lincoln and 12 miles northeast of Grantham. The River Brant forms the western border, while Wellingore parish lies to the north and Leadenham to the south. The old Roman Road, Ermine Street, passes through the eastern edge of the parish. The parish covers about 3,200 acres. Take the A607 trunk road, which passes along the east side of the village, north out of Grantham or south out of Lincoln. The A15 trunk road also passes about a mile and a half east of the village. Ask for a calculation of the distance from Welbourn to another place. You can see the administrative areas in which Welbourn has been placed at times in the past. Select one to see a link to a map of that particular area. In 1666 a devastating windstorm destroyed or damaged many of the homes and buildings in the parish. In the 19th century, the village was served by the Leadenham station, one mile south of Welbourn on the Great Northern Railway. In 1871, the principal landowner was Augustus SMITH, who was lord of the Manor. Land was also held by Colonel REEVE and R. NEVILE, but there were smallholders as well. In 1913, the principal landowner was Catain John Sherard REEVE of Grantham, Geoffrey Henry NEVILE of Wellingore, Robert CHATTERTON and Mrs. Emma Lees BURTT. The parish once had a large castellated mansion. It was the home of Sir John POPHAM. By 1871, only traces of it and the moat around it could still be seen. A monastic house was erected in the 14th century and was later converted to the new manor house. It was occupied, in 1913, by Claude Scholey NORTON. Welbourn is Old English wella+burna, for "stream fed by a spring". It appeared in the 1086 Domesday Book as Wellebruna. In many records the name is recorded with the silent "e" at the end as in Welbourne. White's 1872 Directory lists the following surnames: ALLEN, BAILEY, BELL, BRAND, BROTHWELL, BROWN, BURTT, CHAMBERS, CLAWSON, CROSBY, ELKINGTON, GARTON, GRAVES, HODGSON, LAMB, MABBOTT, MELVILLE, MINNITT, MITTON, MUSSON, PALIN, PEAK, PICKER, PRESTON, PROCTOR, RANDALL, ROBERTSON, SEWARDS, SHAW, SHEPHERD, THOMPSON and WRIGHT. Kelley's 1913 Directory lists the following surnames: BAILEY, BAINTON, BARTHOLOMEW, BURTT, CHATTERTON, CROSBY, DAWS, FISHER, FOWLER, GREEN, HARRIS, HENEAGE, JOHNSON, LAND, MOUNTAIN, MUSSON, NEED, NORTON, PALIN, PARR, PUCKRIDGE, ROBINSON, ROSSINGTON, SCOTT, SOWTER, THEAKER, WALKER and WELLS. Welbourn and Leadenham villages have close ties, including a joint magazine called 'The Two Villages'. The parish was in the ancient Boothby Graffoe Wapentake in the North Kesteven division of the county, in the parts of Kesteven. There are no Bastardy records at the Lincoln Archives for this parish. We have some poorlaw records for Mary HOLLAND from 1746 Quarter Session records. The Common Lands were enclosed here by an Act in 1781. After the Poor Law Amendment Act reforms of 1834, the parish became part of the Sleaford Poor Law Union in 1836. A school was built here by the Countess of Buckinghamshire, the Lady of the Manor, prior to 1871 and was supported by a government grant. In that year, it had 90 students. In 1884, the school was enlarged to hold 164 children. Sir William Robertson High School, Welbourne, Lincoln, LN5 0PA, sports its own amateur radio club (callsign: G4WRS) since 1993. It is part of the STELAR program to promote such activities.